The newly-elected members of the Delhi Congress today unanimously adopted a resolution, urging Rahul Gandhi to take over as the party president. New Delhi: The Congress said Rahul Gandhi was the unquestioned choice of all its workers across the country to take over as the party president and hoped that their desires would be fulfilled once the intra-party poll was over. This came two days after the Tamil Nadu unit of the party passed a resolution, authorising Congress president Sonia Gandhi to announce the new body of the Tamil Nadu Congress Committee (TNCC) and names of the All India Congress Committee (AICC) delegates from the state. 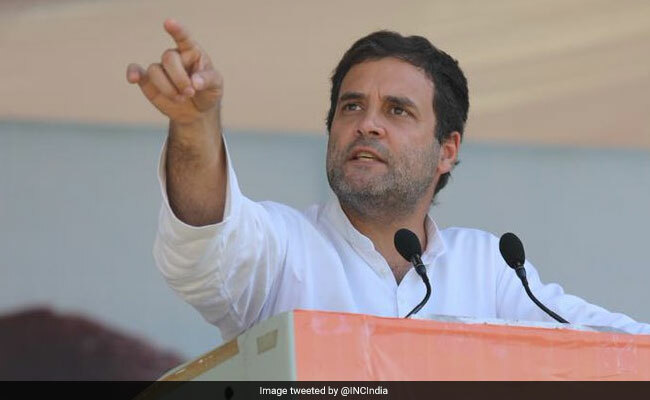 "Congress workers and leaders from across the country have unanimously expressed their desire for Rahul Gandhi to take over as the president of the Indian National Congress. We respect their sentiments. Nobody has any difference of opinion in this regard. Rahul Gandhi is the unquestioned choice of all the Congress workers, who have toiled hard for the party, for taking over as its president," Congress communications in-charge Randeep Surjewala told reporters here. Saying that the intra-party poll process was currently underway, he said, "We sincerely hope that the aspirations of the leaders and workers, who continue to express their desire, would fructify once the poll process is over." The Congress organisational poll process is underway and the process of electing the AICC delegates and PCC bodies, which make the Electoral College for the election to the post of Congress president, is to be completed soon. The party has told the Election Commission (EC) that it would conclude the internal poll process by December-end as per the poll panel's directions. The EC had given a year's extension to the Congress in this regard. Mr Surjewala also took a dig at Railway Minister Piyush Goyal for his reported statement on job losses, saying "ignorance of the ignorant is bliss". "If Piyush Goyal wants all the people of the country to become unemployed, so that they become entrepreneurs, I think they must start that charity from the BJP itself and let him first resign from his current employment and find an entrepreneurial job for himself," he said. Mr Goyal had reportedly said companies cutting down employments was a good sign as the youth of tomorrow wanted to be entrepreneurs.